Endel Kõks had just completed his studies at Pallas by 1943 and thus his more extensive presentation to the public took place in wartime. He also quickly achieved success. Critics were appreciative of his strong colouring and refined taste. Since Kõks left Estonia in 1944, then those four to five years in which he worked intensively form the first and also a separate period in Kõks’s creative work, to which an organic continuation did not follow in his life in exile. In 1938, the 26-year-old Kõks was in his fourth year of study at the Pallas Art School. 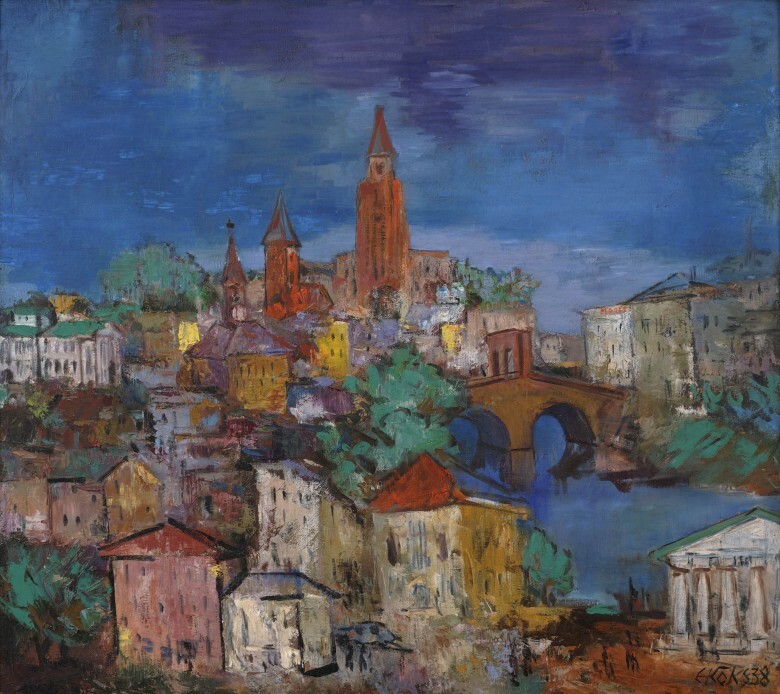 Pallas was located in Tartu and as the most important art school of that time in Estonia, its teachers and students often depicted the city of Tartu (a tradition that faded away after the Second World War when Tallinn developed into the centre of artistic life in Estonia). Most of these depictions, however, are views on a so-called micro-level: streets, yards, courtyards. This kind of panoramic view is exceptional in the so called Tartu chapter of the history of Estonian art and has an effect as if it were a composite portrait of Tartu since Kõks has depicted a view that does not actually exist. It is a fantasy where important symbolic structures in Tartu (the main building of the university, the Stone Bridge, and so on) are brought together. The composition of the painting is also interesting since Tartu is actually located in a river valley, but here the city is built up like a pyramid rising up into the heights, crowned by three churches, adding an almost sacral admiration of Tartu to the work. This work was located in Sweden for decades in the collection of former University of Tartu Professor of Art History Sten Karling. 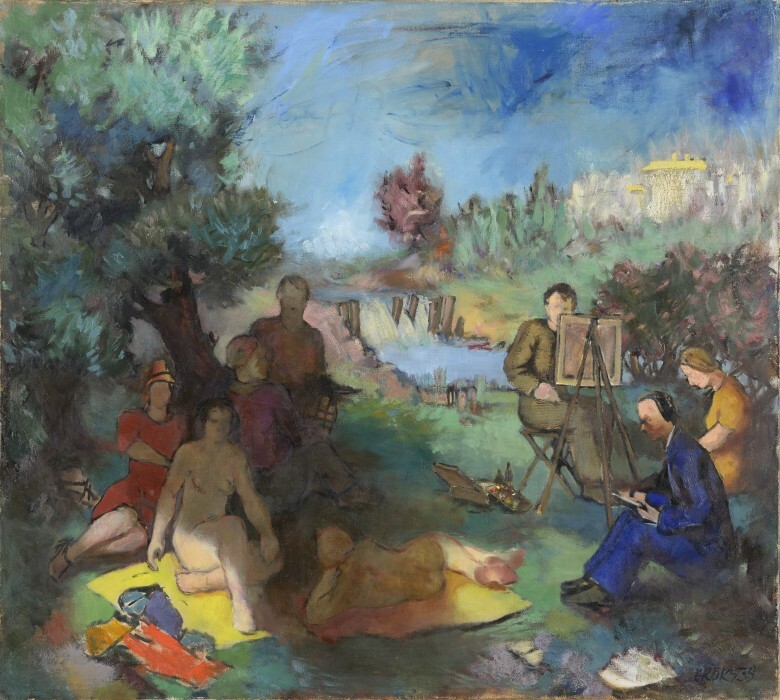 Painters depicts a group of people in a natural setting, which was a rather common scene in French impressionist art. Among others we also see a painter at an easel and a gentleman who is probably sketching (or reading a book). A darkening shadow that falls from above on the left is particularly interesting. 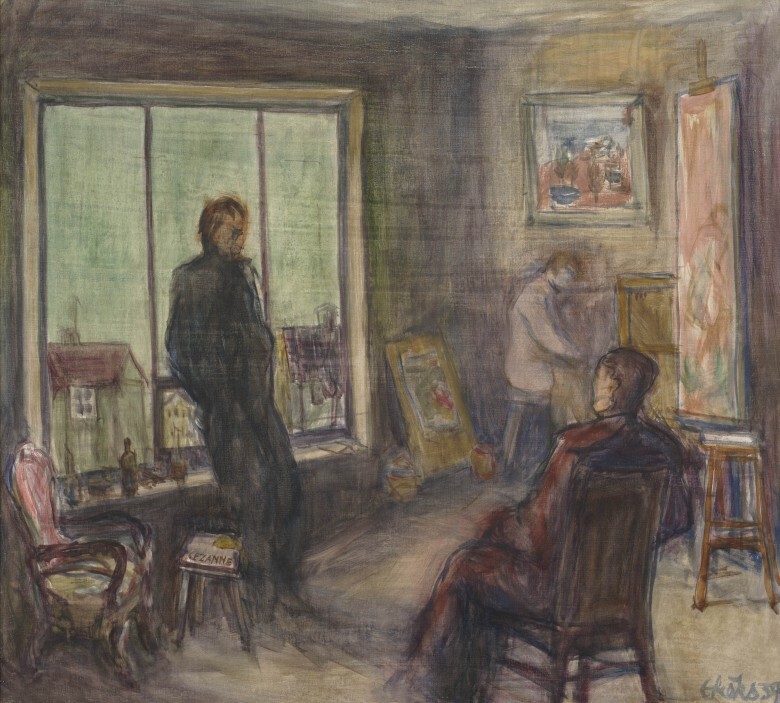 Here Endel Kõks has probably depicted his own studio or that of the Pallas Art School. The latter possibility seems more likely since Kõks’s studio was located in a house that did not have such large windows. Furthermore, that house was a small building built of wood, while the roofs of houses can be seen from the window of this work, meaning that the studio was located on some higher storey. Endel Kõks had just completed his studies at Pallas by 1943 and thus his more extensive presentation to the public took place in wartime. He also quickly achieved success. Critics were appreciative of his strong colouring and refined taste. Since Kõks left Estonia in 1944, then those four to five years in which he worked intensively form the first and also a separate period in Kõks’s creative work, to which an organic continuation did not follow in his life in exile. Then Kõks’s style changed decisively and quite quickly. He worked profusely in 1942-1944. At least 81 works are known from this period according to Kaalu Kirme (2007), yet over 100 works are enumerated already in the catalogue of an exhibition that was held in 1969. Key words like intellectual, rich colouring, impressionism, and Frenchness are used to describe Kõks’s work of that period. 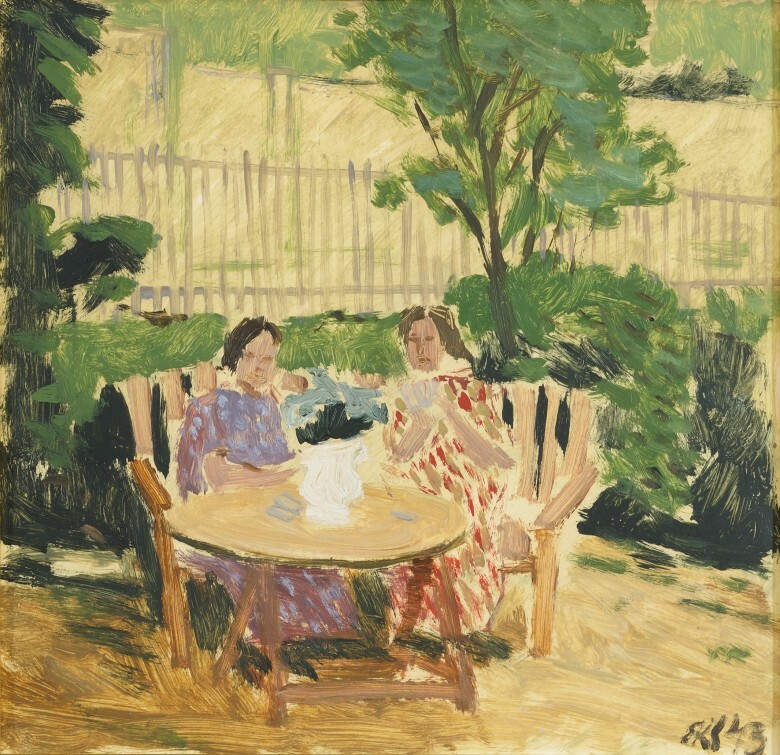 His circle of themes was quite broad at that time since Kõks also experimented, yet he mostly depicted various café scenes, garden and park idylls. He is also known to have painted urban views, portraits and figurative paintings (among other things about the life of coastal dwellers). Several repetitions of the subject used for In the Garden are known from the same year. In wartime conditions, Kõks often used small formats. The use of pasteboard or plywood as base material was also frequent.